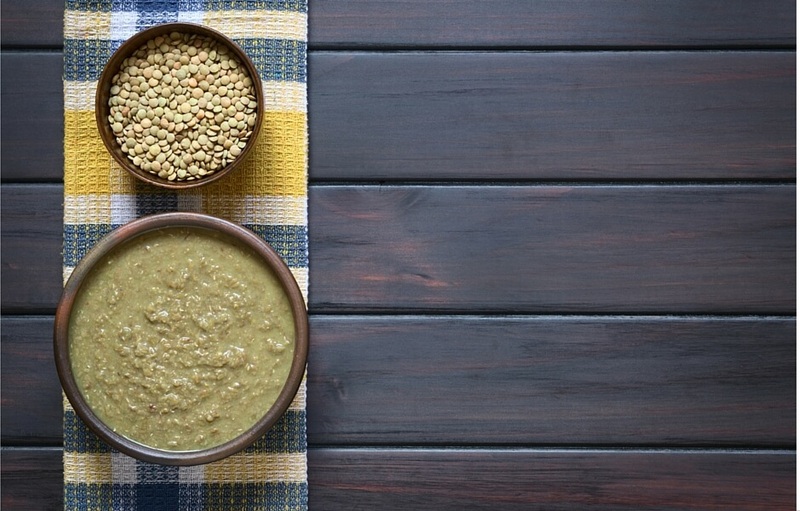 Greek Lentil Soup, two ways! ~ Παραδοσιακές Φακές & Φακές Βελουτέ! “I figured that what may seem like a naively-simpleminded & artlessly traditional legumes-soup to a Greek, could in fact be an unknown source of high nutritional value, a warm, wintry, super-healthy, and super-easy comfort food —hence, The Legumes Chronicles series, where I will be giving you basic recipes for the most common pulses used in Greek cuisine, along with some interesting twists around them”. 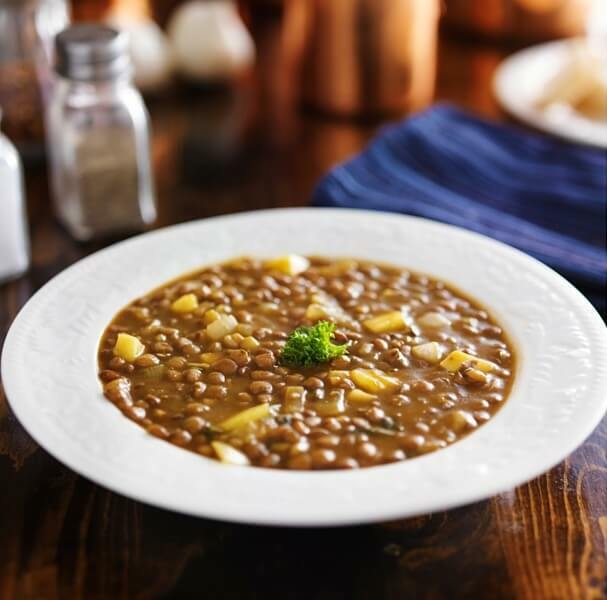 Today I bring to you, a classic Greek Lentil Soup plus a cool little twist, to break the routine now and then! But, first things first, let’s begin with how to prep lentils. It is always best if you can find organic lentils. If you do and you buy in bulk you may have to “sort” your lentils before cooking them. I usually lay them out, on one side of a large cooking pan or any flat surface (a “Pyrex” clear-type pan might also be ideal), and “shift” them by hand, in small batches, across the other side of the pan. 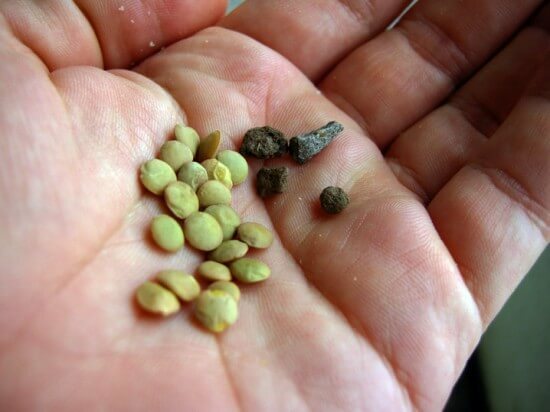 What you are looking for are really, really small pebbles or pieces of the pod the lentils came in, or even chipped and discolored lentils (suggesting they were a bit dodgy before they got dried). Use a sieve to give them a good, thorough rinse! Chop up all your veggies. Heat up the olive oil in your pressure cooker and carefully sauté your onion & carrots for a couple of minutes, then add the celery, garlic & bay leaves. Add the lentils, stalk or water, canned or fresh tomatoes, salt & pepper. Seal the lid and cook for 25 minutes on medium heat. Let the steam off, unseal and open the cooker. Add a cup of finely chopped fresh parsley and give it all a good stir. You can use veggie stock instead of chicken if you are vegan and you can even go for a half stock/half water ratio if you prefer —or if you are not a stock “type” at all, use plain water instead! Be careful if you use the dry bouillon cubes because they are usually quite salty, so make sure you taste your broth before you add any salt. Canned tomatoes vs. fresh tomatoes: even though I usually try to do all my cooking from scratch I do make an exception for canned tomatoes and/or tomato paste (from a trusted producer of course in fear of BPA tin leaches). You can read all about the health benefits of lycopene, and how it’s found in canned tomatoes here. Now, onto making things more interesting! Ζεσταίνετε στη χύτρα το ελαιόλαδο και σοτάρετε το κρεμμύδι & τα καρότα για 3 λεπτά. Προσθέτετε το σέλερι, το σκόρδο & τη δάφνη και σοτάρετε για 2 λεπτά ακόμα. Ρίχνετε τις φακές και προσθέτετε το νερό ή τον ζωμό, τα ντοματάκια, αλάτι & πιπέρι. Σφραγίζετε τη χύτρα και βράζετε με την ειδική βαλβίδα για 25 λεπτά. Αφού σβήσετε τη φωτιά, αφαιρέσετε τη βαλβίδα και μπορέσετε να ανοίξετε τη χύτρα, ρίχνετε τον ψιλοκομμένο μαϊντανό και ανακατεύετε καλά.